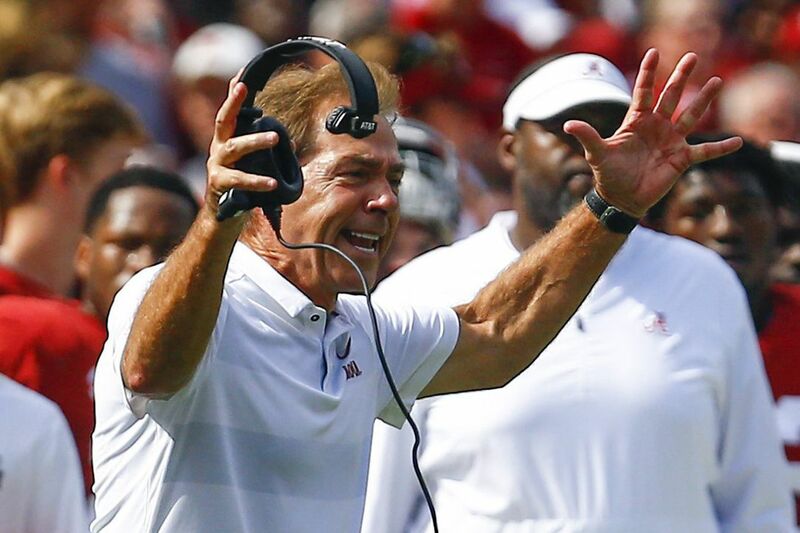 Alabama’s Nick Saban tops FCS coaches in another statistic, one related to golf. After beating Texas A&M on Saturday, the number of victories Alabama football had won since Tiger Woods last won a PGA Tour event. Woods won the Tour Championship on Sunday for his first win since the Bridgestone Invitational in 2013. Alabama quarterback Tua Tagovailoa (13) scrambles for a first down against Texas A&M during the first half. Since that time, the Crimson Tide had gone 68-7 and won two national championships. The second most successful team during Tiger's slump was Ohio State, which went 64-8 with a national title. Woods' alma mater, Stanford, was 53-18. Old Dominion quarterback Blake LaRussa avoids a sack during the first half. The number yards junior quarterback Blake LaRussa came off the bench to pass for in the stunning, 49-35 upset that FCS program Old Dominion pulled over No. 13 Virginia Tech. Before Saturday, LaRussa, who threw four touchdown passes against the Hokies, had passed for 743 career yards. LaRussa's passing yards were the fourth most by an ODU quarterback. Carolina Panthers backup quarterback Taylor Heinicke has the top three spots, including 730 against New Hampshire in 2012. Penn running back Karekin Brooks scores a second-quarter touchdown against Lehigh. The total number of rushing yards Penn junior Karekin Brooks has in two career games against Lehigh, after rushing for 163 on Saturday. Brooks ran 16 times against the Mountain Hawks for an average of 10.1 per carry. He had three rushing touchdowns, including one of 75 yards. Last season against Lehigh, Brooks rushed 29 times for 268 yards and three touchdowns. He did not play against Lehigh in his freshman season. Brooks has 1,181 career rushing yards, so his total against Lehigh represents 36.5 percent of his career yardage, and 40 percent of his total rushing touchdowns (15) have come vs. the Mountain Hawks. Syracuse wide receiver Sean Riley is tackled by Connecticut defenders. The number of seasons it had been since Syracuse started a campaign at 4-0. After beating Connecticut on Saturday, the Orange have won their first four games for the first time since 1991 and only the fourth time since the end of World War II.